It was on January 2 when a few groggy-eyed Facebook junkies logged into their accounts to see a newsfeed inundated with comments over a single bill from Dubai’s popular Cavalli Club that racked up a tally of Dh366K. The media blitzkrieg that followed has snowballed further in the coming days, as neighbouring Abu Dhabi emerged earlier today with its own nightclub bill that trumps the Dubai one by a whopping Dh110,000. Emirates Palace hotspot, Etoiles, has found its name on a bill this time around with a price tag of Dh476,056.88, which was ostensibly settled on January 4, 2012, at 3.44am. 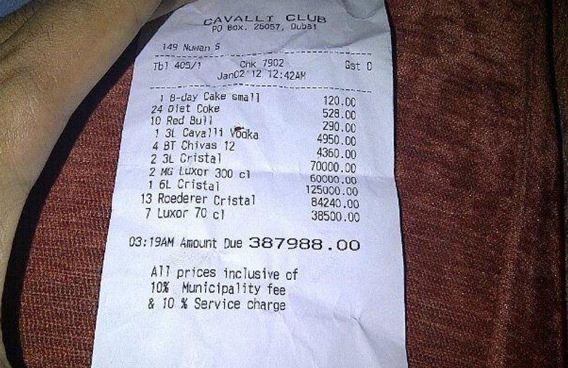 The service charge on this nightclub bill alone is Dh41,211.80, according to the image of the bill that's going viral on the web. Despite repeated attempts by Emirates 24|7 to contact Etoiles management, no details had emerged on the veracity of the bill at time of publishing this article, and the person who footed this astronomical figure remains anonymous so far. However, the favoured drink of choice on the bill is Cristal, which retails at the club at Dh6,000 per bottle; a whopping 22 bottles of the bubbly are listed at a tally of Dh132,000. Notably, the Cavalli Club bill also had three separate billings on Cristal that added up to Dh279,240. Other drinks adding to the Etoiles tally to chalk up the Dh476,000 total are 15 bottles of Dom Perignon Brut and five bottles of Dom Perignon Rosé that add upto Dh109,200. Meanwhile, the most expensive bottle on the menu appears to the 12 Litre Moet Brut that costs Dh66,000. Other items ordered include several other drinks, along with 24 Coke Lights, 24 Sprite Lights and 36 Red Bulls; also a token six bottles of Voss were added as a possible need to hydrate oneself with water after consuming everything else that was on the bill. Facebook messages that have been circulating have been more tongue-in-cheek, with a few posters simply agog by the spending patterns of people at nightclubs. Zeina Younes posted in response to the image of the bill posted: “This has apparently become the new ‘in’ thing,” drawing reference to last week’s Cavalli Club bill also doing the social media rounds. In an email interview earlier, David Lescarret, Operation Manger, Cavalli Club, Restaurant and Lounge, told the website: “Spend of this nature is not unusual at Cavalli Club, Restaurant and Lounge. He added that the Dubai club’s most exclusive item currently on offer is the world’s most expensive bottle of bubbly: a limited edition Louis Roederer, Millennium Cristal Brut 1990, 6L. The bottle is priced at Dh500,000 and only two others are available for sale in the world: one in London and the other in New York.